Stem short, completely covered whit imbricating leaf-sheaths. Leaves distichous, elliptic or obovate-elliptic, or obovate, obtuse or rounded, canaliculate above, carinate dorsally, long 20 cm, wide 7,5 cm. Flower stalk almost erect or arcuate, much longer than the foliage, with rachis in zigzag. Bracts triangular, acute, cucullate, of more than 4 mm. 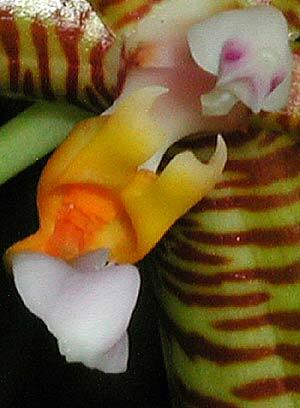 Flower from 4,5 to 5 cm, waxy, fleshy. Well spread out sepals and petals. Sepal dorsal elliptic or ovate-elliptic, acute or obtuse. Lateral sepals obliquely ovate or ovate-elliptic, seldom elliptic, canaliculate at apex, distinctly carinate dorsally. Petals ovate or ovate-elliptic, slightly oblique, acute or obtuse. Lip slightly directed towards outside, 3-lobed, almost as long as the petals. Lateral lobes erect, ligulate with subfalcate tip, incrassate toward center. Midlobe oblong-ovate, fleshy, convex, with a median keel finishing in a callus prominent, ovate provided with some hairs laid out along its edge. Disc between lateral lobes provided of lengthened papillae turned towards back. In front of those at the intersection of the lateral lobes and midlobe is provided a forked acicular callus. Column fleshy, arcuate, widened towards its apex. Pedicellate ovary of more than 3 cm long. Color varying from clear yellow to dark yellow, even with yellow/orange, often with greenish colours. Segments marked of transverse or horizontal bars of color varying from brown/red to cinnamon. Lateral lobes of lip yellow spotted of red to orange. Two-tone median lobe, vivid yellow/orange at the basal third and white with magenta at apex. 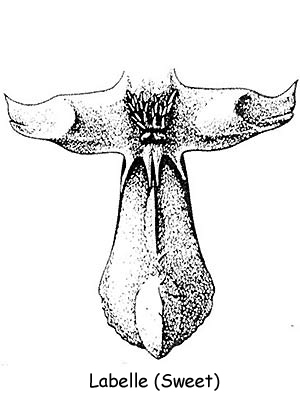 The most typical feature of this species is consisted by the callus located between the lateral lobes, covered with papillae turned towards the back part of the flower. 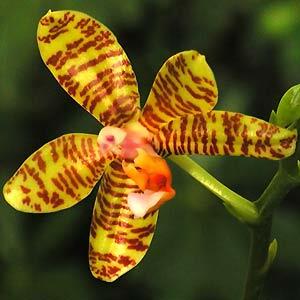 Current in culture, often under erroneous names like Phalaenopsis pallens, sumatrana or amboinensis. Light perfume of green apple. It's a species which one finds since the sea level until an altitude of 450 meters. The floral stalk is able to flower during 5 years. Introduced in 1882 by the Low establishments.